Rockstar will start off with original GTA IV and move onto the Episodes later in the event. 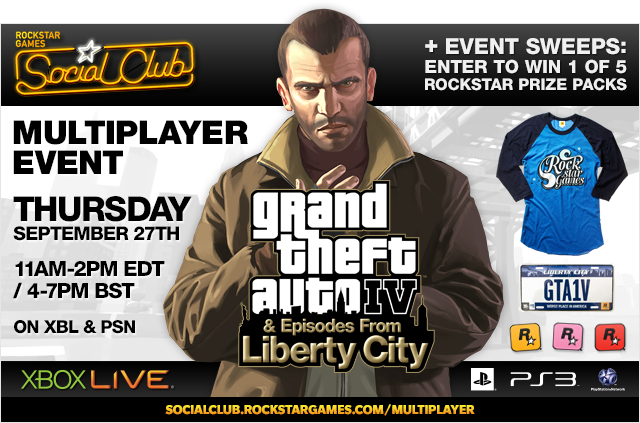 To keep updated on which game modes their squad of Rockstar Games staff players are in, simply follow the live chat over at the Social Club Multiplayer Events page, where they'll also have the customary double live-stream of all the action along with a sweepstakes to win one of five GTAIV prize packs that include the Liberty City license plate, t-shirt, and stickers! Only add one PlayStation Network ID/Gamertag to your friends list to play. Rockstar will clear each account's friend list at the start of the event and accept as many invites as possible. Please bear in mind that spamming the chat room asking for a game invite is a good way to not receive one. Where's Rockstar? Pay attention to the live chat on the Social Club Multiplayer Events page. They'll announce where they're at in there. They will begin in Grand Theft Auto IV in GTA Race, and later progress to the two episodes. Use the in-game cellphone to select the mode they're playing during the event. For team-based modes such as Team Deathmatch, gather your friends using Party Mode. You can also hit up the chat during the event to post your PSN ID/Gamertag in the there. Save your current game. To get started, fire up the in-game mobile phone by pressing "Up" on the d-pad. Select Multiplayer > Party Mode > Yes. Once your team is ready to roll, open up the in-game phone again and select Games > GTA Race. See you in the event and come join the fun at the Grand Theft Auto 5 forums!